Our friend, Paul Filder, had the chance to visit the site where the opening credits of TAGS were filmed. Below is his report. 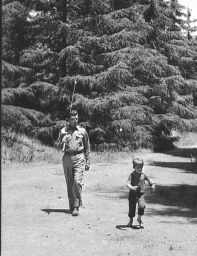 "I was just out there where they filmed all the lake shots (along with the opening shot of Andy and Opie walking along the path). It is a place called Franklin Canyon in a larger place called Cold Water Canyon just north of Los Angeles. They also filmed "Convicts at Large" (the episode where the female prison escapees hold Barney and Floyd hostage) at that location. The place is hard to find, but it is unmistakable once you see the huge evergreen trees -- that area was chosen precisely for the reason that the trees suggest North Carolina rather than Southern California. (My buddy insists that I should have done this anyway -- well, maybe next time when I visit). You can see it from Cold Water Canyon road, but to get to it you have to go into the maze of Beverly Hills till you find this little one-lane road that becomes a dirt road and follows the side of a mountain some ways past all the houses. 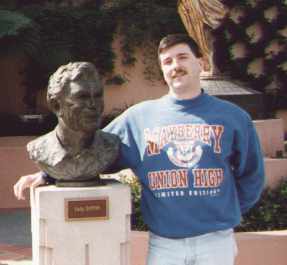 It was actually quite an adventure to find it; I was lost in Beverly Hills for quite awhile before I got lucky. It's not deserted, however: There is a nature conservancy/nature park around the lake. I was hoping for a plaque or something commemorating the fact that TAGS footage was filmed there (especially the famous intro), but didn't see anything like that. Great to visit it, anyway." Recently, Jan and I had the pleasure to visit with "WBMUTBB?" 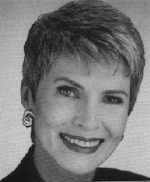 member Jeanne Robertson. Actually, Jeanne was at work. Her 'job', a professional speaker and humorist. The event was actually a Chamber of Commerce annual meeting with Jeanne listed as "Entertainment" on the program and she lived up to the billing. Jeanne shared her 'tall' tales ("Barefooted and with her hair mashed down, shes 62" in her stocking feet") based on her own life experiences. Of course, Jeanne is also one of the "WBMUTBB?" chapters resident authors with her most recent book being Mayberry Humor Across the USA. I just finished reading this one and I can recommend it to anyone who enjoys Mayberry or who enjoys reading things like the "Life in These United States" section in the Readers Digest. The stories are true (or close to it) and prove that the things that happen in Mayberry could happen, even today. If you ever hear Jeanne might be in your area, go and hear her. She can't really speak about just Mayberry while addressing most groups but I can assure you that the stories will contain Mayberry humor. Here we are again, at the close of an issue. The fourth issue of a newsletter that was started for fun and was never planned to continue past issue #1. And our first issue to be published in whole on the WWW. The past year was truly a wonderful, and busy, time for TAGS fans everywhere. Especially for me as I have been afforded opportunities to do things I never expected. Whether it be impersonating Floyd, running a page on the world wide web, or leading a group of folks in TAGS fun on the internet I can only say I have been blessed. You, my friends, have been great in encouraging me in all the things I have done. Thank you for that. It has been a busy time and I have lost track of several items that were requested from me by several of you. If I havent responded to one of your request, please drop me a note and remind me. This year looks as though it will be a bit slower in pace than 95, which is the way we like things in Mayberry. Easy and slow. We can swing but we dont need to all the time. Jan and I look forward to seeing you all during the coming year.